HONOLULU (6 October 2017) Renowned scientists from throughout the Pacific will convene in Lihue, Kauai, from Oct. 10 to 12 to provide recommendations on managing fisheries in Hawai’i, American Samoa, Guam, the Commonwealth of the Northern Mariana Islands (CNMI) and the US Pacific Remote Islands Areas. The meeting of the Western Pacific Regional Fishery Management Council’s Scientific and Statistical Committee (SSC) is open to the public and runs 8:30 a.m. to 5 p.m. at the Aqua Beach Hotel, 4331 Kauai Beach Dr.
American Samoa Large Vessel Prohibited Area (LVPA) options: Consideration will be given to an exemption that would allow US-flag longline vessels over 50 feet in length to fish within portions of the LVPA and that takes into account the needs of cultural fishing practices. 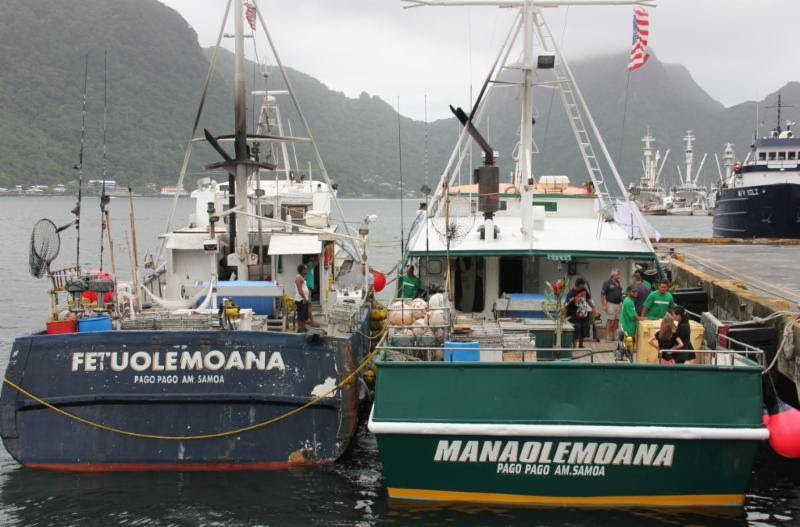 American Samoa Longline Permits modifications: The longline limited entry program was developed in 2002 to limit access to a booming fishery. Subsequently, the small-boat alia fishery shrunk to a single vessel, and larger longline vessels faced economic hardship. In 2011, the Council recommended modifying the program to remove potential regulatory barriers to new entry and to streamline the permit process. At the 170th meeting, the Council endorsed an augmented version of its 2011 recommendation. The Council will consider taking final action on this matter. Annual Sea Turtle Interaction Limits in The Hawai’i-Based Shallow-Set Longline Fishery options: Consideration will be given to the regulatory annual limits on loggerhead and leatherback sea turtle interactions in the Hawai’i-based shallow-set longline fisher and whether the continuation of hard caps that are based on the biological opinion’s incidental take statement for loggerhead and leatherback sea turtle species is necessary given the demonstrated effectiveness of other sea turtle mitigation measures for the fishery that have been in place for more than a decade. Offshore Aquaculture: This action would establish a federal management program to develop a sustainable aquaculture industry in the US exclusive economic zone (EEZ) waters around American Samoa, Hawai’i, Guam, CNMI and the Pacific Remote Island Areas. The program would provide a framework for the Council and National Marine Fisheries Service to review and authorize where, how and how much aquaculture is developed and to regulate and manage aquaculture activities in the EEZ. Fishery Species in Need of Conservation and Management: The list of management unit species will be reviewed to determine the need of federal conservation and management and whether some species could be removed from the Fishery Ecosystem Plans or reclassified as Environmental Components. Annual Catch Limits for 27 Coral Reef Fish Species in the Main Hawaiian Islands: Consideration will be given to the peer-reviewed stock assessment of 27 species of coral reef fish in Hawai’i; an SSC working group’s evaluation of the new scientific information and its recommendation to provide new specifications for five species; and the P* working group’s risk level determinations for the species. New annual catch limits for the species may be recommended. Gold Coral: A moratorium on the harvest of gold coral was established in 2008 due to discrepancies in growth estimates for the species in the Western Pacific Region. This moratorium was continued in 2013 due to the need for additional information and study of gold coral growth rates. The moratorium will expire in 2018. An action will be proposed to ensure the sustainability of the gold coral fishery. For the complete SSC and Council meeting agendas and associated documents, go to www.wpcouncil.org/category/upcoming-council-and-advisory-body-meetings/ or email info@wpcouncil.org or phone (808) 522-8220. Scientific and Statistical Committee: Debra Cabrera (St. John’s School, Guam); Frank A. Camacho (University of Guam); Milani Chaloupka (University of Queensland); Erik Franklin (Hawai`i Institute of Marine Biology); Shelton Harley (Ministry for Primary Industries, NZ); Ray Hilborn (University of Washington); Justin Hospital (NMFS Pacific Islands Fisheries Science Center); David Itano (fisheries consultant); Donald Kobayashi (NMFS PIFSC); James Lynch (K&L Gates LLP); Steve Martell (SeaState Inc.); Domingo Ochavillo (American Samoa Department of Marine and Wildlife Resources); Ryan L. Okano (Hawai’i Division of Aquatic Resources); Graham Piling (Secretariat of the Pacific Community); Kurt Schaefer (Inter-American Tropical Tuna Commission); Craig Severance (University of Hawai`i at Hilo, retired); Michael Tenorio (CNMI Division of Fish and Wildlife). Western Pacific Regional Fishery Management Council: Secretary of Commerce appointees from nominees selected by American Samoa, CNMI, Guam and Hawai`i governors:Edwin Ebisui Jr. (chair); Michael Duenas, Guam Fishermen’s Cooperative Association (Guam) (vice chair); John Gourley, Micronesian Environmental Services (CNMI) (vice chair); Christinna Lutu-Sanchez, commercial fisherman (American Samoa) (vice chair); Michael Goto, United Fishing Agency (Hawai’i); Eo Elvin Mokoma, fisherman (American Samoa); Dean Sensui, film producer (Hawai’i); Archie Soliai, StarKist (American Samoa). Designated state officials: Anthony Benavente, CNMI Department of Lands and Natural Resources; Suzanne Case, Hawai`i Department of Land & Natural Resources; Matt Sablan, Guam Department of Agriculture; Henry Sesepasra, American Samoa Department of Marine & Wildlife Resources. Designated federal officials (voting): Michael Tosatto, NMFS Pacific Islands Regional Office. Designated federal officials (non-voting): Matthew Brown, USFWS; Michael Brakke, US Department of State; RADM Vincent B. Atkins, USCG 14th District.